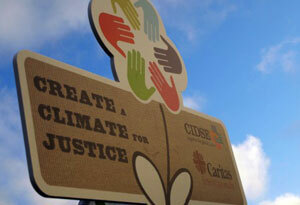 Caritas brings the voice of the poor, demanding a fair, effective and binding climate change agreement in Copenhagen. Caritas members from around the world are in Copenhagen lobbying governments at a key climate change meeting. The UN summit (the UNFCCC) is set to agree targets for cutting the greenhouse gas emissions that cause climate change. It will also set funding for poor communities to tackle the impact of extreme or unpredictable weather and also for their future low carbon/sustainable development. Caritas is taking part in the meeting itself, but all has been involved at a number of events in the city aimed at getting a fairer deal for the poor. On Friday, Caritas bishops, staff and volunteers took part in a ‘Holy Mass for Climate Justice’ at Sankt Ansgar Cathedral. Caritas Africa President Archbishop Cyprian Lwanga of Kampala (Read his homily) reflected on the suffering climate change is causing on Africa. “World leaders must take the tough decisions needed to get a deal that will help the poor,” he said. Caritas staff from El Salvador, South Africa, Zambia, and Europe joined 100,000 people on Saturday to walk through Copenhagencity centre to where the UN talks were taking place. Later, Christians took part in an Ecumenical service in Copenhagen Cathedral. The Archbishop of Canterbury Rowan Williams urged world leaders to show political courage to agree to the painful cuts necessary. The Catholic Church was represented by Caritas Mexico President Bishop Gustavo Rodriguez Vega. He said what Caritas and its partners had achieved would put pressure on governments to listen to the voices of the poor. In Copenhagen and all over the world, bells were rang in churches 350 times to mark the safe level of CO2 in ppm in the atmosphere. On Monday, Caritas Internationalis, CIDSE and the World Council of Churches had a side event at the UNFCCC Conference Centre. The aim was to bring ethical principles and the voices of faith to the climate change negotiations. Caritas Internationalis Vice President Erny Gillen gave this address.